Last week, after a wonderful beach vacation, I was in Munich, Germany for SubConf 2008. First of all, I'd just like to reiterate how weird it is to think that this little open source software project called Subversion has become such a worldwide ... thing. If you had asked me seven years ago how I saw all this playing out, I'm not exactly sure what I would have said, but I can pretty much guarantee the words "worldwide user conference" would not have been a part of it. And this year—bonus!—we were able to combine the user conference with a simultaneously happening developer summit. The start of the week found me still awake, very sleepy, and frantically working to setup a new work laptop. We got back from vacation Saturday afternoon, picking up this new laptop from Amy's parents' place before we arrived at our own home. We unpacked the car, began sorting the dirty laundry, and started the night-long process of cleaning every article of clothing in the house. While the washer and dryer were doing their thing, I was shrinking partitions and installing Ubuntu Linux and copying data from backup. So, with three hours of sleep, we headed off to church on Sunday morning. And after church, we came home just long enough for me to pack some last-minute stuff and drive off to the airport. Now, the flight from Charlotte to Munich is not a short one, but I was only able to grab about an hour-long nap. I arrived in Munich on Monday morning, took a pair of trains to the Riem stop, and began the half-mile walk from the train station to the NH Hotel (where I was staying, and where SubConf was held). Along the way, I passed some friends headed into Munich for some sightseeing: Mark Phippard, Paul Burba, and Hyrum Wright. We agreed to let me check in and drop off my stuff so we could all head out again together. Munich is a beautiful city, and we had a great time trampsing around it. Much of what I saw was stuff I'd seen last year, but it was great to revisit these places with a different group of folks. We got a few rounds of laughs at Hyrum's "mission", which was allegedly about picking up some textbooks for his professor from a German bookseller, but wound up looking strangely like a shakedown of a nice elderly German lady in a faux antiquities warehouse. And Mark's running narration of a pseudo-history of Germany was a steady source of humor (though, I do fear for his children's future social studies grades). On Tuesday, the developer summit began. 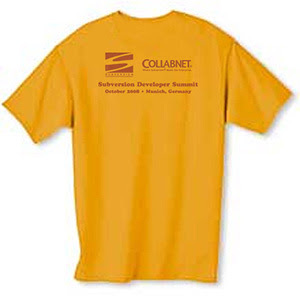 We chronicled much of the happenings there at http://svn-summit.open.collab.net/, so I won't repeat them here. But I think overall the meeting (which continued Wednesday and Thursday, too) was useful for all. Tuesday night the devs sat in a horseshoe shape in front of sixty or so Subversion users to "get drilled" with questions and complaints, but the drilling never happened and folks were (for the most part) quite polite in their feedback. SubConf proper began on Wednesday. I mostly stayed with the other devs in the summit room. I gave the last talk of the evening in one of the tracks, just providing a heads up about what we expect to be released in Subversion 1.6, as well as a little bit about what's currently in the oven for future releases. As always, I was a touch nervous when I first began the talk, but I got over it quickly enough. Honestly, I'd prefer to just field questions so that I know that what I'm saying is at least addressing one person's needs, rather than dumping my previously prepared information in the laps of folks who may or may not care at all. Thursday I again chose to attend the developer summit rather than the SubConf presentations. I still managed to find my way into many side conversations with non-devs over the course of the three days, so I definitely would not count this as a missed opportunity to connect with Subversion's users. And of course the nights ran long as I was hacking on Subversion's 'fs-rep-sharing' logic, releasing ViewVC 1.0.7, and so on. When I finally landed in Charlotte Friday evening after a ten-hour flight, I think I'd had about twenty hours of sleep in six days. But it was so worth it! The Subversion Developer Round Table, which I half-suspected was going to be underpopulated and shy on audience participation, was neither. Conference organizers were surprised by the turnout, and there were almost no moments of awkward silence. Meeting some of the other developers I hadn't met before: Erik Hülsmann, Bert Huijben, Neels Hofmeyr, and so on. As Hyrum noted on his blog, the somewhat spontaneous emergence of the idea of "packing" Subversion FSFS revision shards was both unexpected and a source of pleasant reflection throughout the conference. High-bandwidth discussion with other developers. I love my wife and kids, and they are great sounding boards for development ideas, but the feedback quality is — somewhat lacking. Erik H. rockin' the red corduroy pants, red sweater, and red-and-white striped shirt beneath. I can't pull off style like that. Souvenir (and dinner) hunting with Hyrum on Thursday evening.